Microsoft released the Azure AD B2B and B2C services last year. The main goal of both services is to provide an Enterprises the ability to grant “external” accounts access to their services. Although there is major difference in the use of these services. Business to Business (B2B) is mainly focussed on collaboration between two different companies so people can interact and work together with for example the same application or within the same project. 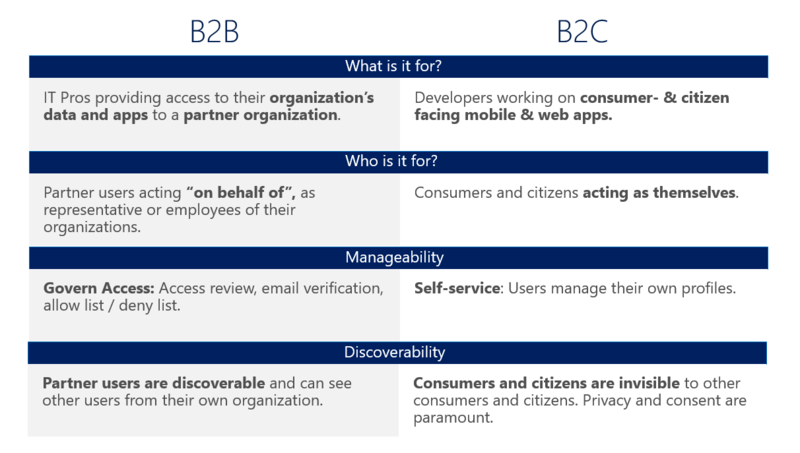 Business to Consumer (B2C) is meant for the Enterprise’s end-customer granting the ability to login using a single IdP (or your Social ID) to access the company’s services. Buying something online in a web shop or the downloading an invoice on the personal page of your magazine subscription are some examples of a typical B2C scenario. According to my experiences there is also some grey area for which the characteristics does not exactly match one of the scenarios shown above. Think about scenarios in which an Enterprise is the end-customer of a certain service the other Enterprise delivers. For example, an energy company which delivers online service to other companies to provide insights into their electricity usage of the buildings the company owns. This brings challenges like how can we assign a customer administrator role with privileges to invite other people within their company? This is more like a B2B feature in a B2C scenario. Let’s see with the future will bring for these types of scenarios. For now, it requires some creative solutioning using the B2C service…. A lot of new features came out the last couple of years all focussed on enabling cloud scenarios for enterprises. This is achieved by bringing your corporate identity to the cloud using a hybrid scenario or by creating a whole new identity. These scenarios are all based on the Azure Active Directory type of tenant. Now Microsoft introduced a new type of tenant named Azure Active Directory Business to Consumer.